Jenny was 45 years old when she was diagnosed with MS in 2011. Her symptoms began the previous year with pins and needles in both legs, which continued to worsen until Jenny was completely numb from her chest all the way down to her toes. Jenny also experiences Optic Neuritis in both eyes, which affected her balance and meant she was not allowed to drive for three months. A referral to a Neurologist gave Jenny the unexpected diagnosis of MS, but thanks to the Neurologist’s recommendation to contact MS Queensland, Jenny has felt informed and supported from the beginning. Jenny is fortunate that MS has not prevented her from doing anything at this stage, but she is conscious that Ms is unpredictable and she could take a turn for the worse at any time. 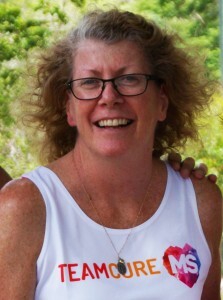 Living in the moment, Jenny has participated in numerous MS Queensland events and was one of our very first Team Cure MS members.